One of the must have toys for Christmas 2014, the Snow Glow Elsa doll from the film Frozen is currently in short supply throughout the UK. We constantly track for stock which ensures you will be the first to know when availability is found. 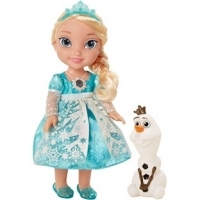 Checkout our Argos Snow Glow Elsa store checker to locate in-store stock. Just touching her snowflake necklace will awaken Elsa to talk to her Frozen friends with 15 phrases which recreates your experience of the film. Also included is the cute Olaf the snowman. Recommended for age 3+, requires 3 x AAA batteries (included). We constantly check for Snow Glow Elsa stock, so you don't have to. 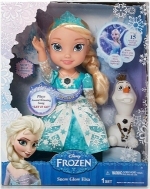 Receive email alerts when Snow Glow Elsa online stock is found.